it's been a long and busy week. i've been barely keeping up...and definitely not reading/writing/responding to comments. sorry! but i've been out and about a little...so here are five places i've been this week...and here's to a new week of far more sleep and therefore far more motivation! Postville...are you following this story?! Can I make these? Actually, I just want to eat them. But making them leads to eating...go click. Trust me. how many - each tribe. and what part of town. all the tasks for them. *Numbers is the English name for the fourth book of the Torah, called Bamidbar in Hebrew. The word Numbers gives an excellent explanation of what is contained within the book...and so does Bamidbar. Taken together, the words give a very full picture of what is to come in the book! I'm Having a Quickie too! One person in my house likes to take looooooooonnnngggg showers. It's not the little ones. It's the 6 year old. Yep, he likes to take long, steamy showers. So when I saw that the Crunchy Domestic Goddess has a Quickie Shower Challenge, I knew this was the way to do it! I told David all about my friend Amy, who lives in Colorado, and that she had a challenge for him. He was very excited, he even wanted to do it in under five minutes (which we did). And not only did David take a shower in about 2 1/2 minutes, he did it with his brother Sam! Aren't you impressed that I showered two of my children in under 5 minutes? They were really clean too. Who knew that all it took was a timer challenge!? The allure of a challenge for a 6-year-old. The only downside? Since Sam didn't quite get the idea of the "challenge" (2 years old is a little young to get it, right? ), he was pretty upset at the abrupt end to his shower. We'll work on it. Later in the evening, I even showed David Amy's blog and had him read the headline on the post. I introduced him to her children and we talked about all the ways that we can help the environment. He even told me that in his Kindergarten class they have cups with their name on them instead of throwing them out each day. I had no idea they were so environmentally-aware in his school. I'm quite excited about this opportunity to cut down on our water usage. This is what is working for me this week! P.S. The Kosher Cooking Carnival is up...take a peek! I drove by Wisconsin Memorial Park this weekend. They had their annual Avenue of the Flags...for Memorial Day. I had to stop and try to capture a few pictures. We're not good at Memorial Day here in the U.S. It's not like in Israel. And maybe it should be. That's my torah this week. What's yours....leave a link. So my dad got a new camera. I actually have a little taste now of how it must feel to use some of the really cool cameras that so many of you have. It's not an SLR but it is really really cool. We spent a lot of nice time outside on Sunday, in my parents' backyard. Even though they live near a busy street and in a relatively noisy suburban area, there is a large deer population. Someone noticed a really cute little fawn curled up and resting in the "forest" area of the yard, which has been cut back recently. We all walked over to see him (her?) and quietly observe our own little Bambi. Me: Sam, look at the deer. Sam: Is not a deer, mom. Is a cow. Me: No, honey, it's a deer. Sam: "Deer." But is a cow. Me: I have to go get the camera, this is a blog! Sam: No, Mommy, is a cow! See more Best Shots here. FrumeSarah did her thing and let me tell you, it's great. Go check it out. So much to read, so little time! Electric Radiant Floor Heating for Basement....mmm....this sounds nice. In case you haven't seen it, Jewish Week just published their list of 36 people under 36 years old who are the innovators in Jewish life. Check it out, very interesting to see. I wrote this post on my other blog about learning conformity at a young age. Go check it out and leave me a comment to let me know what you think. Naturemoms had this really interesting article on avoiding commercialism with kids. But the header graphic was the most arresting part of it all, I thought. What an image. Do you get this e-zine in your inbox? If not, you should. It's got really interesting discussions and articles for Jewish women. This month's issue just came out. Go check it out. Crunchy Domestic Goddess is tackling the issue of obstetric fistula. Go read her article and be properly outraged. Then do something. Have a great Shabbat. May rest and relaxation find their way into your life. We're in the period of the Omer. You may have noticed that counter over there <---- that my dad made for me. We count the days from Passover until Shavuot, from the Exodus to the Revelation. The period of the Omer is considered a time of semi-mourning, in which certain things are not done. Some people don't cut their hair or have parties or weddings. Why "lag"? It comes from the gematria, or counting, for the day: "lamed", ל, (L, value 30) and "gimel", ג, (G, value 3), making up "Lag" (33) לג. You can learn more about the whole thing here. 2. Go on a campout, like Robin. 4. Make a big ol' bonfire. 7. Cut your child's hair. Jody, are you reading this? 8. Get a commemorative t-shirt. 9. Give tzedakah. It never hurts. 10. Get married. You can't get married any other day of the Omer, so this is your choice between Pesach and Shavuot. 11. Shave...if you're not shaving during the Omer. I hope to post pictures before and after of my brother. Since he hasn't shaved since Pesach. He actually looks pretty good with the beard, tho! 13. Blog about it, of course. As promised, one lucky commenter on this week's Haveil Havalim post will win a signed CD by The Josh Nelson Project, the new release Lift. Submit your posts for FrumeSarah's version of Haveil Havalim here. I'm not a gardener. Never have really grown or taken care of anything plant-like. But somehow, I feel a yen to grow vegetables. (I'm still not taken with the idea of flowers, although they are pretty.) It seems a little like a requirement to start becoming greener...to eat some tomatoes that weren't grown halfway across the world. I've started reading some gardening blogs. Just a few, mind you, I'm not going overboard here! And, thanks to eating lots of Stonyfield Farms yogurt (a whole other post...how much yogurt my kids eat), I now have a free subscription to Organic Gardening magazine. So I decided to try "container" gardening. I bought a few big bins, put in some soil, and bought these cool plants that come in pots that don't have to be thrown away! That is the part that worked really well, by the way. So here they are: three different kinds of tomatoes, oregano, basil, chili peppers, and some lettuce seeds. 1. I used some organic potting soil mixture that had some composty-type things in it. When I flipped over the bags at home to cut them open, it said "not for containers." (Actually, it was after I had loaded almost all the dirt into the containers that I noticed this sign.) Why? Will it be a problem? 2. I bought a "tomato tower" because my dad assures me that they are going to get bigger. When do I put it in? Hopefully this will all work for me! Thanks to some good genes, I have a lot of hair. And it's curly. And I like it...which is something of a change from high school and even college, when I hated it. Since I've arrived in Chicago, I have had 2 haircuts (the pulpit) of our synagogue. Each time, I did it with a group of kids and adults who were also donating 10 inches of their hair to Locks of Love. This time, it was a little different, since we're out of our building. There was still a group of kids and adults who were doing it with me. But it felt different, somehow, to be standing on the stage of Highland Park High School's auditorium, where we've been holding our Sunday School. And yet, at that moment of the cut, the whole room felt holy to me. Each time I say it's going to be my last haircut of that magnitude. But then I start to grow it...and it just feels so right. After all, how many of us can grow our own mitzvot? It seems almost a shame not to do it. That's my Torah this week. P.S. Check out my newest crush. My daughter does seem to have a bit of an obsession with my Starbucks cups. She always wants them! One day last week we were playing outside and, sadly, I ran out out coffee. Yael, on the other hand, was not sad at all...because she had a new and wonderful plaything: Mom's cup. I have often wondered about the effects of marketing on our kids. My husband remarked the other day that our now 6-year-old believed that Target and Toys R Us were "toy museums" where he could look but not take things home...until he was about 4 years old (unfortunately, he now knows exactly how shopping works!). My 2-year-old, on the other hand, already understands completely that Target is a magical place from which toys often come. I'm sure in some ways this is due to having an older sibling who is making him wise to the ways of the world! Would she care if it weren't a Starbucks cup? What if it were a cup from the gas station, or from some fast-food joint? I haven't explored this with her, and I'm not sure I'm ready for the experiment! All I know is this...if I have it, she wants it. Maybe it's less about marketing and more about "being like the big people." Which is something that I know I need to remember all the time. Not only are my children little sponges, they are also little mirrors. Sometimes it's cute. But sometimes... darn it if I don't always like what I see! I know that if I start with myself, I will improve them too. For the moment, I guess it's not so bad if she's interested in drinking coffee. See more pictures and musings here. Welcome to Haveil Havalim #166, the MommyBlogger Edition. Thanks to FrumeSarah (I'm sure it's her fault) and Jack (for jumping on my innocent little comment! ), I agreed to play hostess to the Haveil Havalim Jewish Blog Carnival. I must admit that it was fun putting it all together, albeit a little nerve-wracking to get it all done around Shabbat and the the last day of Religious School today! ProfK asks some serious questions about the role of parents vs schools. Are Jewish charter schools the answer? Daled Amos explores this idea. Jewish Sandwich wrote Losing our Religion, reminding us to be respectful of both Ashkenazi and Sephardi customs. Strong Jewish Women presents Mirror, Mirror, on the Tabernacle......, an interesting take on the gifts of the Israelite women. Schvach shares a potentially-davenning Jewish pigeon. Velveteen Rabbi offers a poetic rendering of Parashat Behar. So do I, with my weekly parasha haiku. The Rebbetzin's Husband gives an excellent drash about heroes, shmitah, and the Nazir. Did you know that observing one-day Yom Tov can actually be more stringent than two-days? Read BZ's post for much more. Can we be unaffected by traumatic events? A Simple Jew poses the question. Life-of-Rubin compares Crown Heights to Israel, for the good and for the bad. We turn our prayers to those injured in the attack on Ashkelon this week and ask...what now? George Bush was in Israel this week, and he had this to say, as analyzed by Yid with Lid. 60Bloggers has played host to some great posts this week. Jameel give us Israel's Youngest Fallen Soldier, Rabbi Daniel Brenner (fellow Badger!) gave us Eretz Yisrael, Gila Weiss chipped in with ?האם תרצו, Leah Jones gave us Postcards to Israel, Leah Koenig was Eating My Way Through Israel. If you haven't been reading 60bloggers, go check it out from start to finish. It's such an interesting conglomeration of various Jewish writers and bloggers from all parts of the Jewish world. Jameel breaks the gag-order on the Olmert scandal here and gives an examination of The Laundry Man that adds another layer to the news. Batya looks at the NY Post on the same subject. Batya shared a bit of politics along with the winner of the World Bible Contest as well as thoughts about a Muslim's words. Think the Israel conversion issue doesn't affect you? Read this from On the Fringe's Shira Salamone. A Rebbetzin's Husband offers an English transcript of the court rulings. Dr Savta wrote birthday wishes for Israel (so young!). Me-ander shows us the newest Israel coin - the shnekel! A fighting spirit is what it takes, says British Yosef. Eric dissects an article on Israel from the LA Times. He is awaiting their response. Post-Yom Haatzmaut Thoughts from Dan at Tzipyah remind us criticism is just as much a part of our celebration as the celebration itself. Soccer Dad investigates the propagandizing of the term Nakba. Yid with Lid discusses the myth of the term Palestinian, and he attended the UN Nakba Rally and shared his thoughts. For Toby at A Time of the Signs, strangely translated packaging abounds! Robin invites us to know hope. Treppenwitz, whose son Yonah had his tonsils out this week, live-blogged and got a chuckle out of the experience. Glad he's home and doing well! FrumeSarah brings a musical twinge to her musings on Israel. Israel is getting on the anti-plastic-bag bandwagon, says the Green Prophet. Yisrael wonders whose hat is burning now, which mikveh he's really in, and what George Bush is doing with that pushke. JC@Simply Jews tries to explain some Israeli logic. Is it logical? You decide! Work-related thoughts from Israel definitely offer a giggle from Benji Lovitt. I'm hooked! Jewish bloggers are lurking everywhere, Schvach thinks. Are we? Robert Avrech examines the story of a Jewish kid who made it big in Hollywood...not the one you're thinking of, I'm sure. Miriam takes a personal approach to defending human rights. Did you know that we have our own Wikipedia entry? I didn't! 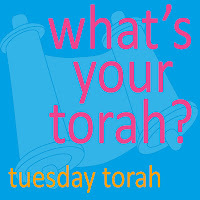 The growth and change of our life dreams was the topic for Tuesday Torah by FrumeSarah. Marci participated in a Rabbis for Human Rights gathering and posted about it. Jena@BullseyeBaby (subject of this wonderful interview here, btw) writes about the power of seeing the sun. In case you missed it, The Jew and the Carrot shared this story about Masbia, a soup kitchen serving steaks. Leora does some beautiful artwork and she shared it with her daughter's kindergarten class. What can we trust in our children to learn? A Mother in Israel explores this question. This week's Torah portion is Behar, from the book of Leviticus. comes after six years of work! Today is a day for bloggers to come together and stand on one issue, this time it's human rights. What can I possibly say about human rights? 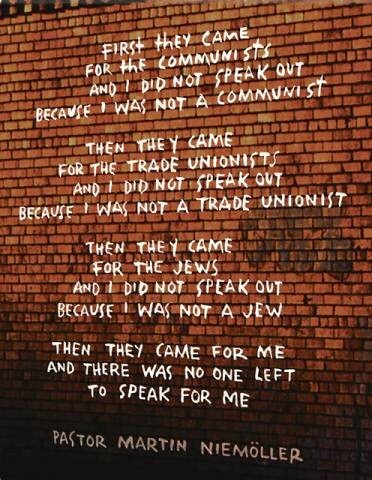 It's overwhelming and unbelievable to me that while I sit comfortably on my couch, there are people around the world suffering from unbelievable abuse. Even in our own backyard. Around the world, there is violence against women, violence against children, terror in the streets. We can sign a petition. We can make phone calls and write letters. 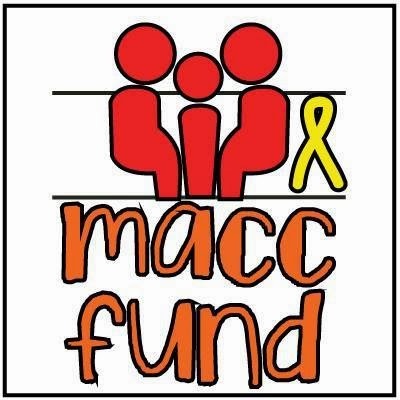 We can travel and help and support. And we must do all these things. Because we can't stand idly by. Are you blogging about human rights today? Leave me your link and I'll update this post to include you. MomGrind has something to say about homelessness. Read Marci's post about Rabbis for Human Rights. Deb, Momof3Girls, has this great Thursday 13. Miriam wrote about her own personal and close-to-home fight for rights. Tuesday Torah: It's *always* Mother's Day! Mother's Day has come and gone. And while I appreciate the gesture, I really feel that we have the obligation to honor our moms (and dads too) all the time, every day. And while I know how much of a break most moms need, why do they only get it one day of the year, and why do we celebrate motherhood by spending time away from the kids? One of the problems with mom-land is the "competition"...you know: "my kid is reading at a third grade level..." "well, little Johnny has already completed his black belt..." etc... Perhaps it's one of the things I love and appreciate about the blogosphere -- we are not afraid (most of us) to post our kids successes and failures, we are not afraid to talk about our own successes and failures. Being "supermom" isn't necessary out here. We can just be ourselves. And you know what? We are enough. To be a proper 2-year-old, you must have an opinion about everything. Most especially, about the clothing you wear and the accessories that you add into your outfit. See more great shots here! P.S. Haveil Havalim #165 is up here (this is the Jewish and Israeli blog carnival) and, as usual, it's great! Next week, I'm the host so stay tuned! 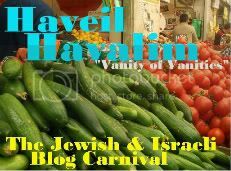 Haveil Havalim -- the Jewish blog carnival. I'm the host this week! Submit your post at this link...or email me directly phyl613 at yahoo.com! First and Last Frost Dates...I'm planning to grow me some tomatoes. Toilet Paper Roll craft ideas - something to do with 'em! Molly's Kindergarten Journal ...feeling inadequate but also inspired! from my del.icio.us ...where have you been this week? After all, I'm a mom of 3 - and I'm at my 3rd movie in 8 days....<Strong>with my husband and no kids</strong>!!!! Shocking, I know! So what's next? Cheap gas???? PS I'm hosting Havel Heveilim Jewish blog carnival next week....see the sidebar over there on the right....join the fun! Celebrate Shabbat by helping others...leave non-perishable food items by your mailbox tomorrow and your mail carrier will take them for the nation's largest one-day food drive ever! or the sidelocks of your beards. Do not gash your flesh. each one on its date. and he was a blasphemer. He was stoned by all. Kill a man - you die. If you kill a beast - you pay. The laws are so clear. Plus, read my 60bloggers post about Israel here. ...believing that the tie-dye shirts from the store that say they are color-safe really are. Even after a few washes. What doesn't work for other folks? Check it out here. What a fabulous way to honor your mom or any other woman in your life. Click here to make your gift! You can't get an actual card delivered in time for Mother's Day anymore but you definitely can get an e-card...so if you're still deliberating, try this out...I know it will make a difference to your mom and to other moms too. But I was really disappointed with the Walk With Israel on Sunday. Granted, we missed the "rally" at the beginning. But that was because it took 20 minutes to park the bus and another 20 or so to get through security. There wasn't really anyone along the walk route to tell us where to turn for the "family walk"...the only person who was really noticeable as a staffer was asking for tzedakah. Each participant signed a JUF pledge card before they came...and you're asking for spare change? The news coverage was almost nil. Either way, I think that the "Walk with Israel" has lost its purpose, its steam. A nice stroll along the lake wearing a t-shirt with an Israeli flag is nice but doesn't really create connections with Israel. Maybe American Jews aren't connecting with Israel because we're not making it real enough for them. That's my torah today. A bit muddled but still frustrated. He likes to come and visit us on Tuesdays, my day off, and hang out with me and with his grandkids. Often, it's just Yael and I to entertain him...and he doesn't seem to mind this special time with his youngest grandchild! Hmmm....can I get this on my hand? See what other pictures people think are great this week. Haveil Havalim is up over at Simply Jews...check it out. It includes this post of mine. Please send your posts for the next edition of the Haveil Havalim Blog Carnival via the Blog Carnival Submission Form. I found [me too!] this to be very helpful in organizing your posts this week. If you're interested in hosting or receiving more information about the carnival, please contact Jack at talktojacknow-at-sbcglobal-dot-net. What a fabulous way to honor your mom or any other woman in your life. Click here to make your gift! Do it before Monday for Mother's Day delivery of your card. Sweet Ribbon Valance -- for Yael's room? 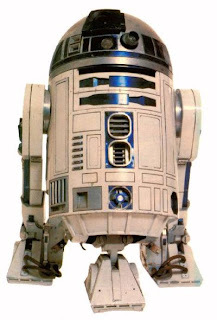 May the FOURTH be with you always! yes, that is me laughing at this joke every year! is what we call this portion. observe Shabbat and keep it. leave it for the poor. swear falsely or cheat others. don't impede a blind person. or cut the side-locks of beards. Do not turn to ghosts. and show deference to them. and measures in your business. apart from the other folks." See more Haiku writers here.